Goals are "real" until they're written down. And they aren't something to get excited about until you share them with people - your spouse, your coworkers, your boss. And once you have them in front of you, you should be excited to get out of bed - every morning. I ask people all the time, "Are You For Real?!" And this authenticity begins with how you communicate with people. There's nothing more engaging to other people than being yourself. 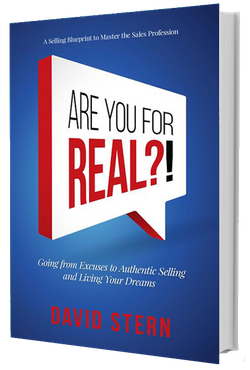 Listen in on my own lesson in being real and the difference it made in my life. Understanding that we all need goals, what are yours? Fear. Doubt. Excuses. What's keeping you from reaching your goals? Work with a certified coach like David Stern from the John Maxwell Team to improve your odds for success, in business and in life. How do I stand out in sales? How can I improve my relationships with my clients? What habits should I develop in order to stay on track with my goals, and stay successful in business? All of these questions can be answered when you make a personal investment to work with a business coach. David Stern spoke recently to a Power Entrepreneur group to help them get closer to where they want to be and WHO they want to be. Real, authentic advice that's built a successful career of more than 40 years... listen to what these enthusiastic audience members had to say. Then, let's talk. Copyright © 2017 David Stern | All rights reserved.